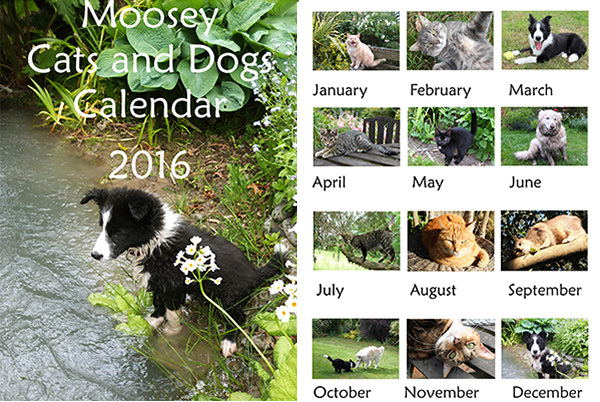 Here are my archive 2016 cat and dog calendars. One year they might line up the days and dates again. It's not so easy recycling old calendars! The first features cat and dog photographs recycled from the year 2015. You'll meet the new puppy Winnie, and two new kittens Buster and Tiddles, together with the older cats, and Rusty the senior dog. The calendar is in a PDF format, and can be downloaded and printed for no charge. There are fourteen pages in all. Some folk like to print off one month at a time for their noticeboards. Because the full file might be annoyingly big for you to download, I've split the calendar into four quarters. Here they are below. The old faithful furry followers are still here, though two loved Moosey cats have passed on since these photographs were taken. Ginger Percy and Grey Lilli-Puss - we still miss you! 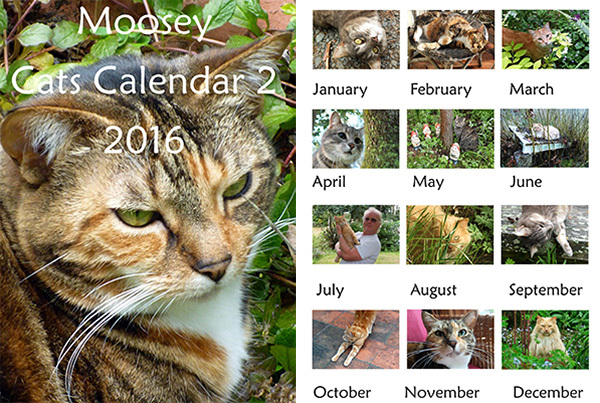 This 2016 calendar featured six cats, with photographs taken in 2014 : the fatties Tiger and big Fluff-Fluff, the greys Minimus and Lilli-Puss, ginger Percy, and Histeria the tabby. I try and take photographs of the cats in the garden, as there's usually one somewhere near where I'm working. Tiger the tortoiseshell is the exception - she stays near the house. Well, more specifically near the fridge. 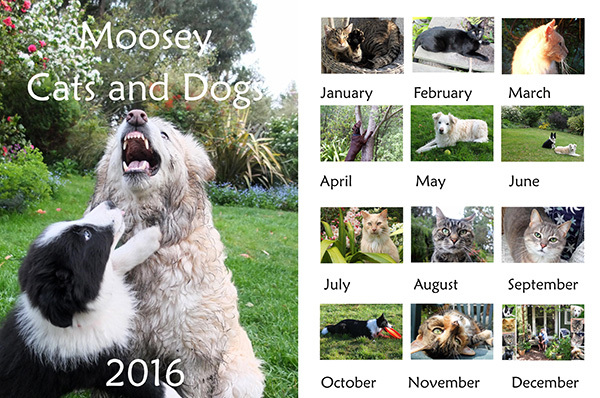 This 2016 calendar featured the latest photographs of the Moosey cats and dogs. Winnie the puppy is now a sleek, fluffy one-year-old, and last year's kittens have turned into cats. All the cats and the dogs provide lots of good company, especially in my garden. I'd be very lonely without my furry friends. Brown dog Escher, featured in April, is just visiting, living with us in the country while his town house is being built. He's a big smoocher, and I'm going to miss him dreadfully when he leaves.